The Board of School Education Haryana has been changed the mode of examination Computer Based Test to Pen-OMR based of all candidates.A notification and list of candidates who had applied for CBT is available on the official website of BSEH www.bseh.org.in.As per notification published on HBSE website that mode of examination for the candidates have been changed,from computer based test(CBT) to conventional Pen-OMR based without charging any additional fee, due to non-availability of sufficient computer nodes as per choices of examination centers submitted by the candidates online. 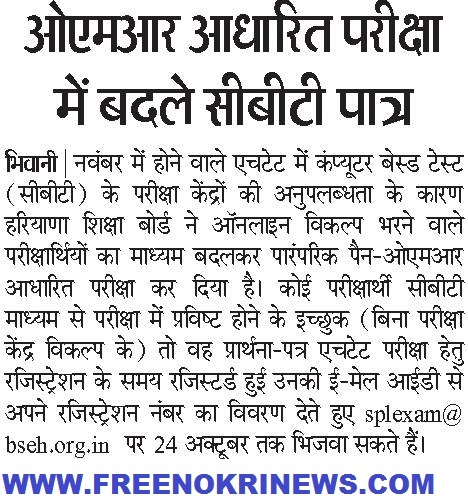 As per spokesman of Board,if a candidate is willing to appear through CBT mode, irrespective of location of examination center,he/she may send his/her request using email id from email registered at the time of online application of HTET 2015 up to 24.10.2015 to splexam@bseh.org.in.No request will be entertained after due date. Time of Exam- 10.30 AM to 01.00 PM.Date of Exam-15.11.2015 Sunday. Time of Exam-03.00 PM to 05.30 PM.Date of Exam-15.11.2015 Sunday. Time of Exam- 11.00 AM to 01.30 PM.Date of Examination-14.11.2015 Saturday.